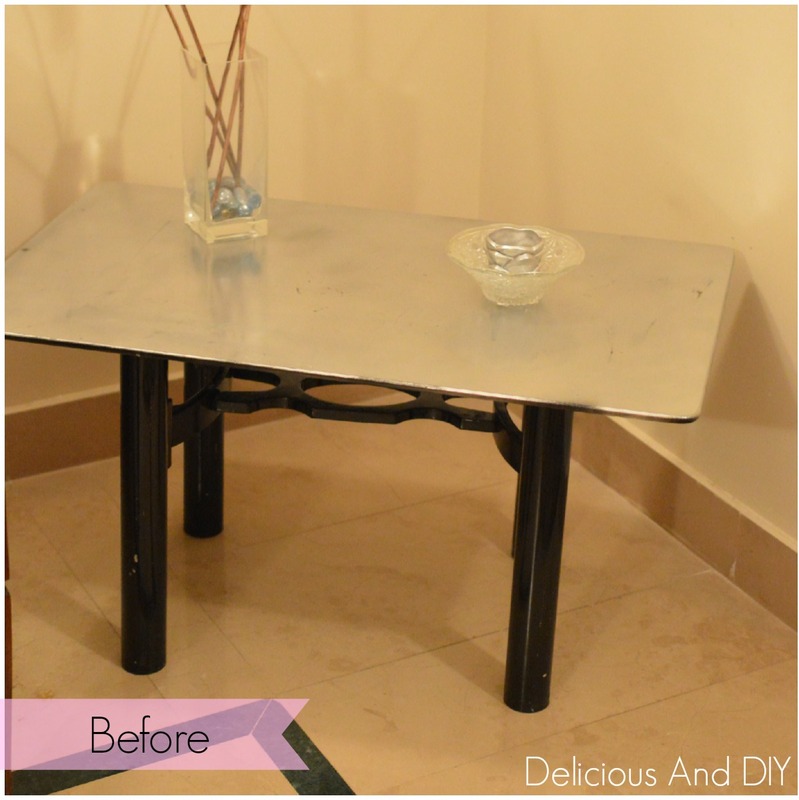 So I was in the mood of experimenting with different techniques in my furniture makeover and I came up with the idea of using Aluminum Foil. To give the table a DIY Faux Silver Leaf transformation. The table I was going to use this method on was a really old table I had in my house for almost twenty years so it really wasn’t an issue if it didn’t work out for me. This table already had undergone several transformations. First off its original legs were Silver in color but since it was so old that it had become rusty. Hence I painted it all black. Then after a few years I spray painted the entire top Silver. Now here we are back at it again with another makeover session. So I didn’t mind the silver spray painted top and kept that as my base, using my masking tape I taped off the table into squares. I ended up with about twenty squares. On top of the masking tape I painted the squares in the different shades of pastels alternating between the boxes. I let the squares dry while I worked on the Aluminum Foil to give the Faux Silver Leaf Effect. So I cut up about twenty Triangles out of the Aluminum Foil for the square boxes, the idea was that it would be half silver and half the color of the paint. You can play around and see how you want the placement of the Foil to be like and after that using Mod Podge apply a thin layer and place the foil on top and seal it on. The last part was to tackle the legs of the table. So you know the Gold Dipped Legs trend that I have done on multiple projects for instance my Chair Makeover. I wanted to do the same on this table but more like half Aluminum Foil and the other half would be the existing black paint. I covered up round about 3/4 of the legs with the foil and using the same Glue technique I did for the top. Let it dry completely before you start using the table. This table definitely gives me vibes of my Coffee Table Gets the Royal treatment transfomration. How stunning and super budget friendly was this whole makeover? Would you do this on your own furniture piece? What a great makeover! You have such fabulous projects! Thanks so much for joining my hobnob this month Welcome! Hi Anam. Came over from the Blog Hobnob and love your creativity. Would love if you came and shared this Sunday at 6pm PST on the Merry Monday Link Party. BTW- tried to follow using your G+ button at the top of your blog and it goes to the G+ main page, not to your personal profile. What a great idea. I’ve been looking for some ideas to do with some old tables. This is inspiring! Very creative idea! Thanks for linking up to Gingerly Made! This is so creative. I love the diamond pattern! Thanks for sharing with SYC. I like this so much. I was hoping you were going to show the mirror too. It is my first time here. I love color, pattern and texture.